Saturday was dark and rainy as was Saturday night. Our scheduled observatory open night, of course, was canceled due to opaque skies. The good thing was the decision was easy; no partly-cloudy skies to tease us! I hope nobody showed up… my predecessor in the job used to open for visitors even if the telescope couldn't be used due to weather. Not me! So we stayed home and watched a film I never heard of —Noel— picked up at Target for cheap. Turns out it was a fair movie: not predictable except that it contained at least one "Christmas miracle." It boasts a strong cast including, uncredited, Robin Williams whose character gets his Christmas wish. Well, I won't tell you what his wish is >>no spoilers here<< but it's probably not what you think. The weather was better on Sunday. She ran the oven's cleaning cycle and cleaned the racks in the morning. Then we went out for a Taco Bell lunch and a little shopping excursion to Medina just to get out of the house. We made a quick stop at Petiti's Garden Center which is now all decked out for Christmas. The real reason for the stop was to pick up gravel to ballast the base for a Christmas tree idea She came up with. More on that project and a photo or two later! After a stop at Medina's Target for cat litter and to stock up on bottled beverages (Vitamin Water), we stopped in at an intriguing new place: Good Taste Wine and Food Shop. Wonderful food smells greeted us as we entered the modern building. We were greeted warmly by staff and wandered around the place: part kitchen shop, part cooking school, and part restaurant. Not much for non-carnivores, nonetheless a pleasant visit. It turned out Medina was having their annual holiday kick-off on their Public Square: their Candlelight Walk weekend. It was late afternoon when we visited but there were horse-drawn carriage and wagon rides and stores were open that usually are not open on Sundays. The square and it's old buildings are charming and beautiful. Nearby big box stores have hurt the little guys in noticeable ways but, every now and again, some uniqueness shows up. The business mix regularly changes and we miss a couple of shops we came to treasure there. We did stop by the (genuine) "army surplus" store (where I picked up a pair of woolen glove liners), a home decor shop, and a hobby store. 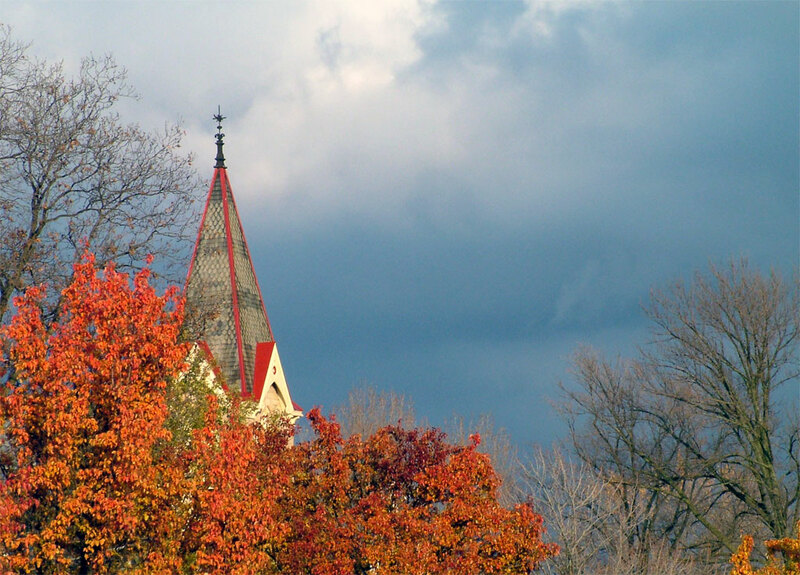 As we were packing into the car to head home I saw a beautiful scene: a church steeple rising from behind colorful autumn trees. I grabbed my camera and got a few shots from the courthouse parking lot. Off to home where I cooked up a nice pot of bean and spinach soup, enjoyed with crusty sourdough bread. The weekend started off rainy but ended nice. Sounds like a wonderful weekend! The photo is beautiful!